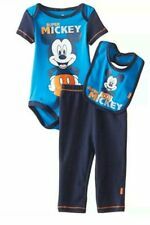 Jumping Beans Boys Size 18 months Sweat Pants - Navy Blue Color. 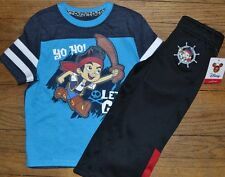 Jake and the Never Land Pirates Outfit. Disney's Jake and the Never Land Pirates. Long Pants - Athletic Style Micro Fleece Lined Super Comfortable pants. 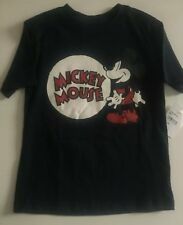 Made of 60% Cotton & 40% Polyester. Made of 100% Polyester. Shirt and coveralls. Disney Baby. Size Newborn. Beautiful Red Orange and Gray (crayon for color comparison). 2 BURTS BEE 100% ORGANIC COTTON BOXERS 12M. FRUIT OF THE LOOM MONSTER JAM SHIRT XS. 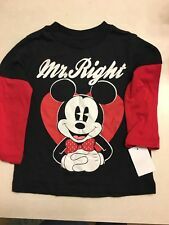 DISNEY MICKEY MOUSE RACE CAR SHIRT SIZE 4/5. 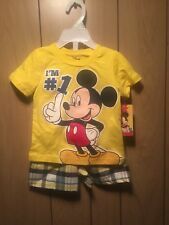 UMBRO SHORTS SIZE 3/6 M.
DISNEY MICKEY MOUSE 3 PIECE BABY OUTFIT SIZE NB 3 6 9 12 18 MONTHS NEW!